About: Union Hospital of Cecil County is a full-service community hospital in Elkton, MD. The 83-bed, not-for-profit organization has been nationally recognized for clinical excellence in the treatment and prevention of disease. Challenge: Going completely digital and achieving HIMSS Stage 7 had been long-time goals for Union Hospital. After the hospital migrated to MEDITECH’s latest release in 2014, Union’s executive team decided paperless care, and achieving HIMSS Stage 7, were within reach. HIMSS Analytics tasked Union with presenting a minimum of three case studies that display how they harness analytics to drive change and improve practices. Execution: Union assembled a core team to review HIMSS Stage 7 requirements and verify these had been met. They also collaborated with MEDITECH through our HIMSS Stage 7 Program to ensure they were prepared for the survey visit. The Union team’s 304-slide presentation, covering 12 case studies, wowed the surveyors and led to HIMSS Stage 7 designation. Implementing scanning to become 100% paperless. 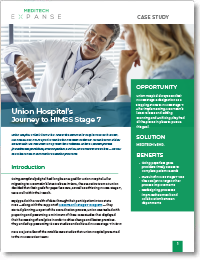 Results: Union encourages HIMSS Stage 6 hospitals to pursue Stage 7, noting that for them, it was a natural progression. The surveyors were particularly impressed with how “data rich” the hospital is; with the new designation, Union is confident they now have the leverage to continue harnessing technology to optimize patient care and incorporate best practices. Improving teamwork and collaboration among departments.